Posted on February 3, 2011 by Kathy T.
At 8:30 tonight, my 15-year old had already gone to bed … she and her friend are getting their beauty sleep for tomorrow! Tune into Channel 4 News tomorrow from 5-7am…. Cool Schools will be at LaVergne High School!! Choraliers will be singing 1st thing!! Dont miss it!! After the crazy hours I’ve kept this week, I expect to be in a deep sleep at 5:00 a.m. Y’all tell me what I miss! Posted on November 20, 2010 by Deborah B. Thank you for the dedication to the students at La Vergne Lake Elementary, La Vergne is proud to have Elizabeth Farmer recognized as “The Educator of the Week”. Posted on November 12, 2010 by Kathy T.
Want to hear just how extraordinary the high school choir is? Tonight is your chance! From 6:00 – 9:00 p.m., the LHS Choir is hosting A Chili Night in November. The cost is $5 per person or $20 per family (up to 6). Following the meal, the Choir and Ensemble will be performing at the high school. 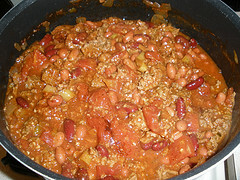 To whomever came up with the name A Chili Night in November … I say awesome! Photo by Tony Alter via flickr creative commons.